Body: Carmel, closed hands, rivets in shoulders, medium brown hair. Accessories: Soft medium brown, dark hard brown. Box: Mod cactus striped box, litho box. 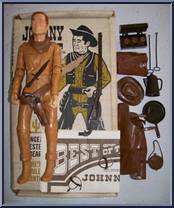 Johnny West has 11 points of articulation. He is made of solid poly plastic with the hands being made of vinyl. The clothing and accessories are made of either a hard or soft plastic. Contribute pictures, update details or suggest corrections for Johnny West (Carmel, Rivets). Write a review about Johnny West (Carmel, Rivets).